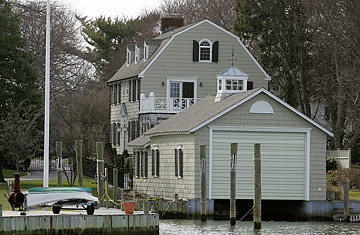 The house on 112 Ocean Avenue in Amityville, N.Y., an upscale Long Island suburb, was the site of a brutal family murder in which 23-year-old Ronald DeFeo, Jr. shot and killed his parents and four younger siblings on November 14, 1974. But much of the legend surrounding the home stems from the family who moved in a little over year after the murders. George and Kathy Lutz and their four children, knowing about the tragic events that had taken place, agreed to see the property  including a 4,000 square foot house, waterfront access, a boathouse, heated swimming pool, garage and full basement  and eventually bought it. "As soon As Kathy had walked into the house, she had a smile on her face that just beamed. That hadn't happened in all the previous homes we looked at," George Lutz recalled later, describing the events at Amityville at a paranormal convention. "I knew from the look on her face, that this was to be our dream home." Soon after moving in, though, things changed dramatically. Even after having the place blessed by a priest at the urging of a friend, George and Kathy said they began experiencing strange things: banging noises, footsteps untraceable to any family member's movements, mysterious and pervasive odors, green jello-like substances leaking from walls, toilet water turning back, swarms of houseflies and eyes peering in from outside the windows. Even the family's behavior began to change: George was often sick, went days without bathing and lost weight while Kathy had constant nightmares. The children began to fight with each other. After the disturbances worsened, the Lutzes decided to leave the house temporarily. But the night in which they were to depart turned out to be their last night there. Although George Lutz is reluctant to explain the full details of that night, he once said that "the hardest thing for those people [who experience a haunting] is the loss of being able to communicate with anyone else about it...It's not talked about, it's not understood...and when it happens to you, you become an alien to everyone else." The Lutzes' entire account was later dismissed as a fabrication by a paranormal investigator, the late Dr. Stephen Kaplan. Ultimately, Kaplan said, George's stories of haunting were "too wide-ranging" and probably stemmed from a pre-existing obsession with the paranormal.